Anz‎él Gerber’s Tchaikovsky was a delight in it’s complexity – her dexterous fingers and graceful souring melodies concealing a clearly hard-earned technique within this virtuosic work for cello. 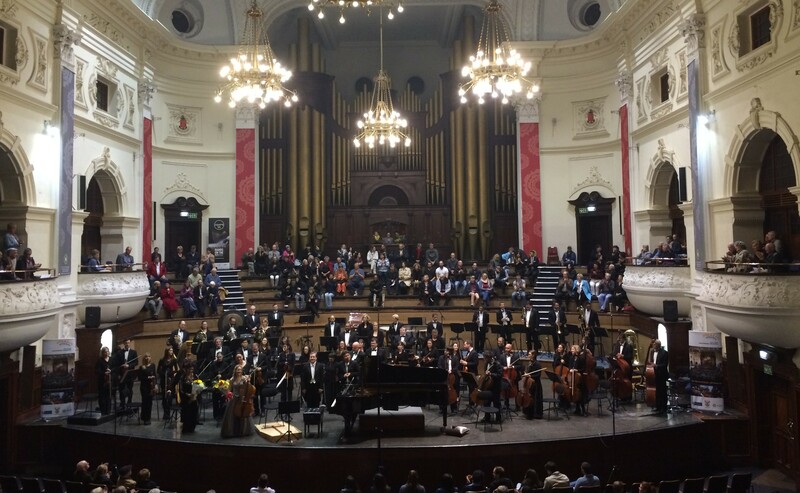 And virtuoso was the flavour of the evening… If Saint-Saëns is occasionally overlooked as a great pianist, there was no doubting it after Ben Schoeman’s performance of the Africa fantasy. This highly technical, syncopated work is a juicy challenge for both piano and orchestra. Schoeman rose to that challenge with accuracy and sensitivity, and the orchestra held his syncopated framework together with the kind of wonder that one finds in architectural structures that have much of the load-bearing rhythm removed, and seem to defy possibility. It requires a master navigator to hold a flight like this together, and we were fortunate to have an experienced pilot such as Shinozaki on the podium. I enjoyed the “Bushman Prayers” by Stefans Grové more than I expected after hearing his “Figures in the Mist” in October last year, which I found difficult to access. To quote Ben Rabinowitz: “In art we know when we like, but in music we like what we know.” – It’s quite possible that my ear is tuning in to Grové’s extended tonalities and rhythms, or perhaps Aviva Pelham’s passionate delivery of the prayers (poems by Dia!Kwain) helped connect the awkward, hungry, dissonant sounds, particularly in the first movement – Prayer to the Sun. But it was with the second movement that I connected most deeply: Prayer to the Moon. Gerber and Schoeman, to whom the work was dedicated, created a most beautiful, hauntingly mysterious Moon-rise that seemed to hover larger than life, as if we could see every canyon and crater on the Moon’s surface. The work is rhythmically extremely challenging, and well handled between Shinozaki and the percussion section. There are few mediums beyond religion in which a gifted artist can describe God, but symphony is one such medium, and Sibelius is one such artist. From the eerie opening by Beatrix du Toit and Christoph Müller, (clarinet and timpani) conductor Shinozaki demonstrated a level of comfort that enables him to alternate between crystalline precision in his direction of details, and relative freedom in sections where the orchestra can safely continue at their present tempo. Another highly technical and rhythmically unusual work, the performance of this symphony requires the highest level of skill from both conductor and orchestra, and last night we were reminded of the world class calibre of the CPO. Shinozaki was dynamic and pragmatic in his interpretation, highlighting melody and subduing background, and the resulting sound was the symphony that the composer intended, an accessible print of Sibelius’ experience in lofty profundity and dogmatic human limitation. Is this your favourite symphony? Please take the Classical Top 100 survey! The Yablonskys From Left: Oxana Yablonskaya, Dmitry Yablonsky, Janna Gandelman. Dmitry is Oxana’s son, and takes the masculine form of the family name Yablonsky. In Russian, the feminine form of the family name ads an “a” or in Oxana’s case, “aya”. Janna and Dmitry are married. The enchantment of the opening melody was immediate – we were transported exactly as Borodin intended, to a windy grassland of lakes, yurts, and distant snowy mountains. We were treated to world class solos from the wind section and excellent low volume control by the horns. Yablonsky conducts with an unassuming confidence that communicates well with the players. They kept a suspenseful pace that highlighted the dynamic ability of the orchestra, and held this tempo as the work transforms into the majestic coda, richly embellished by warm shiny trombones and full juicy strings. It was a most delicious hors-d’oeuvre! An extremely technical and difficult work, this concerto was first written when Rachmaninov was 16, and then underwent a number of revisions. It contains all the ambition and imagination of the young prodigy’s developing signature style, with occasional splashes of Tchaikovsky and Grieg. The pianist plunges immediately into a virtuosic, rapid melody in octaves, and it was a genuine pleasure to watch an artist of such calibre as Yablonskaya taking the roll of the story-teller in this spectacular show piece. Beyond her jaw-dropping technique, she creates amazing dynamics within phrases that bring to life Rachmaninov’s journey through beautiful mindscapes, with sudden changes in temperature and scenery. The cadenza was explosive – a thundering, powerful narrative told by an enchanting orator, utterly compelling – spellbinding. Yablonskaya interpreted with the charisma of one performing a solo sonata, which I find perfectly placed in this concerto as the piano is undoubtedly the hero of the story. I enjoyed her dramatic sense of timing, good volume above the full orchestra, and when needed, her fingers run like clockwork! We are very fortunate to have procured Yablonskaya for this and the next concert, Beethoven’s Triple concerto. 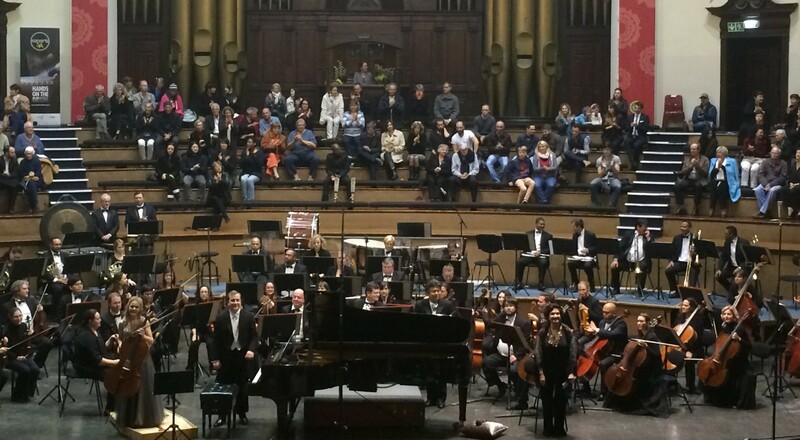 After much encouragement, Yablonskaya presented a Scarlatti sonata – the perfect encore. It was like relaxing with a refreshing ice tea after an exhilarating voyage. Conductor Yablonsky’s style is easy on the ears. His subjects and sections were sensibly phrased and well built, which highlighted the form of this remarkably influential work. His beats are clear, at the top of his arc, causing concise entries even with the full orchestra in fragmented rhythms. The symphony, 1875, contains many themes from the Swan Lake ballet, 1875-1876, which Yablonsky presented lyrically and with a wonderful sense of movement. Another noteworthy influence is the amazing running section by the flutes, reminiscent of Rimsky-Korsakov’s Flight of the Bumble Bee, 1899-1890. Tchaikovsky’s beloved winds had plenty to do, performing the balletic melodies with allure and grace. Bassoonists Simon Ball and Brandon Phillips are to be commended, mastering alternating octaves and tricky triplets; horns were stunning with an unusually long, seamless pedal tone requiring expert breath control; and clarinets Beatrix du Toit and Oscar Kitten were magical with rippling arpeggios over a deep sea of cellos. Yablonsky maintained his majestic style that carried him into the phenomenal, ground-shaking coda, releasing all reserves, and leaving the audience with a smile. At the reception after the concert, I was talking to a retired architect who described how he likes to go on a journey or “trip” in his imagination, while listening to a piece of music, which is exactly how I first connected with music from the romantic period. I wondered how many others accept the invitation of the composer and performer, to allow the participation of our imagination with the story being told. Are composers and performers are like hypnotists, offering us the choice to follow the journey, or remain unmoved?